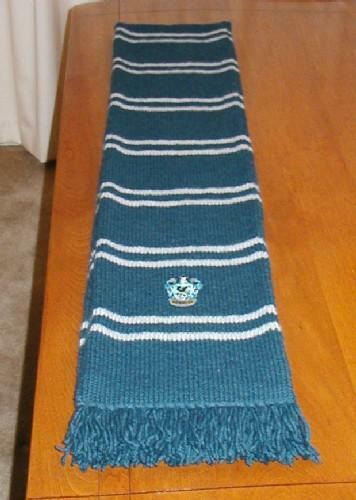 Last night I finished my second scarf, the PoA-style Ravenclaw in movie colors that I bought the yarn for before I even completed my first scarf. Unlike that first one, this one I did all by myself. It took a few–okay, four–tries to get it started properly. At least I managed to fail in a different way each time, so it was a good learning experience. I continue to find Knitting in Plain English to be an excellent reference, but am glad I also got the other book my knitting mentor Denise recommended, Vogue Knitting, because without the pictures in there I might still be struggling with getting that first row in the round started. 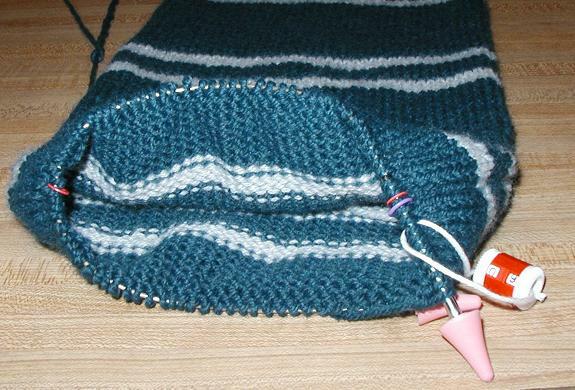 About the time I was getting going on this scarf, there was a post on hp_knitting which mentioned that for an item knit in the round, putting a purl stitch where the seams would go would help the piece lay flat. Since I figured I’d eventually need to learn to purl, I decided to modify the atypically.knit pattern accordingly and do knit 44, purl 1 instead of all knit stitches. It worked out pretty well. I put a marker before each purl stitch, using a different color and material than the marker for the end of the round so I could see at a glance where I was; that made it easy to know when to make the other type of stitch even when I wasn’t looking at the needles as I worked. The “seams” ended up looking pretty nice (that picture is the jog side, where the colors change). I used bigger needles for this scarf than the last one. At first I tried US 8 as called for in the pattern and on the ball band, but I evidently work a little loose and didn’t like the look I was getting with that size, so I dropped down to a US 7. (I splurged on Addi Turbos, too–they are nice and slick.) Still, that’s two up from the 5’s I used last time, so the scarf definitely turned out bigger; it’s about 86 inches long (before almost 3 inches of fringe at each end) and not quite 9 inches wide. I used almost 1000 yards of the main color, Plymouth Encore worsted in shade 555 (I’ve seen this called Dark Country Blue as well as Bristol Wedgewood), and almost 200 of the contrast color, Plymouth Encore 130 Oyster (a.k.a. Silver). 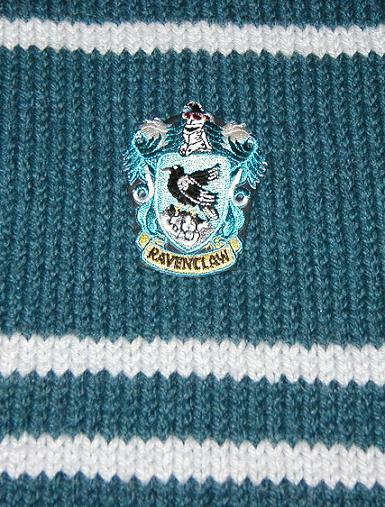 Putting the patch from Patch Palace on was easier this time because I’d figured out how with the last scarf. Because this grey isn’t all wool like the last scarf, I washed this one in the machine on gentle (running it through an extra rinse to get the soap out) and dried it a bit in the dryer before laying it on top of towels on top of plastic bags on the floor. The faux seams did seem to make it easier to lay it out flat. 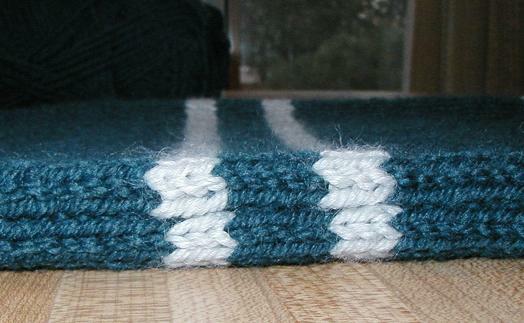 Now I am done with scarves for at least a little while. I bought an extra ball of blue for this one so I didn’t have to worry about running out, so I think I will try making a hat with that. Most of the patterns I’ve come across where I like the looks of the finished product call for double-pointed needles, which I can’t quite figure out how I’ll manage to use without having stitches slip off at one end or the other or possibly both, but I guess I won’t know until I try. 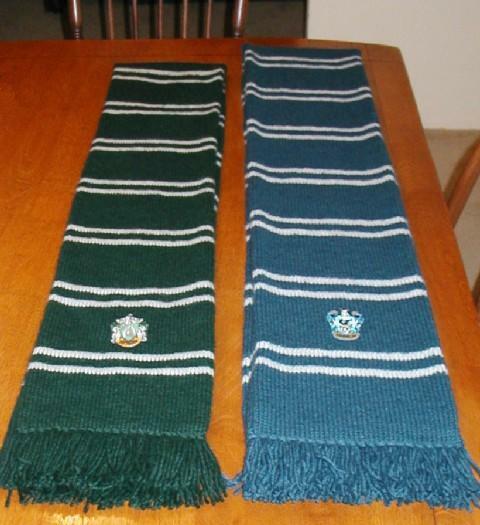 One year ago, I looked for signs where there might be none and shared a silly scarf. Two years ago, there was no entry.